The Redcliffe Museum tells the fascinating story of the history and community od Redcliffe. Redcliffe, a beautiful peninsula located on the northern end of Moreton Bay, was the site of first white settlement in Queensland with settlers and convicts landing in 1824. Through multi-media and object based exhibitions, visitors are able to learn not only about the Peninsula's past, but also about the character of Redcliffe as it is today. Tuesday - Sunday 10:00am - 4:00pm. Closed Mondays except for group bookings. Closed Christmas Day, Boxing Day, Good Friday & Easter Sunday. Open other Public Holidays. Open Anzac Day 1:00pm - 4:00pm. Wheelchair access, Guided Tours by arrangement, Picnic Area, Volunteer Program, Education Programs, Theatrette, Brochure/Information Materials. The collection ranges from domestic and farming technology, to business equipment and war memorabilia. A photographic collection is augmented by an excellent postcard collection. The Museum also holds a significant collection of Japanese artefacts from Redcliffe's Sister City, Onoda in Japan. The "Gayundah" (an aboriginal word for lightning) lives on as a part of Redcliffe history. It's wreck lies at the foot of the red cliffs of Woody Point, beached there in an attempt to reduce erosion. 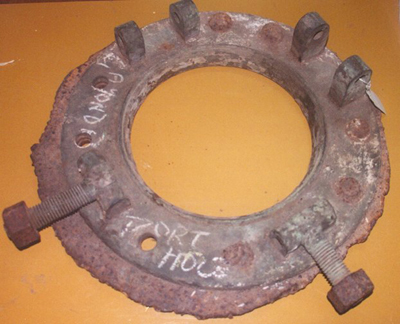 This porthole was probably removed by enthusiastic beachcombers and it eventually found its way to Redcliffe Museum in 1980. The HMQS "Gayundah", a gunboat commissioned by the Queensland Government, was launched in 1884 at Newcastle upon Tyne, England, arriving in Brisbane in March 1885. In 1885 she was the most heavily armed ship of her size. In October 1888 the "Gayundah" was central to one of Australia's best known mutinies, triggered by the Queensland Government's heavy-handed treatment of Captain H Townley-Wright, who had been ordered to hand over command to another officer, but refused to comply. Instead, he moored the "Gayundah" on the Brisbane River and threatened to fire on Parliament House. Eventually Townley-Wright was removed from the ship and the situation defused. The "Gayundah" made history again by transmitting the first message from a ship at sea to an Australian wireless station. The ship's aerial was a tall bamboo pole lashed to the mast. In 1904 control of state defence forces was transferred to the Commonwealth of Australia and HMQS "Gayundah" became HMAS "Gayundah". For the majority of "Gayundah's" career she patrolled Moreton Bay and the Brisbane River. At the outbreak of World War 1 she was one of the oldest ships in the Royal Australian Navy and after the war she was retired from the Navy. The "Gayundah" continued to work as a sand and gravel barge on the Brisbane until she was beached on Woody Point in 1958. 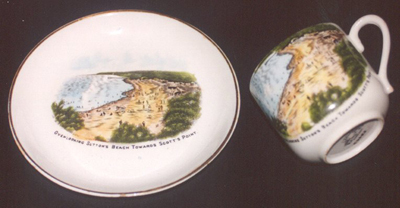 This small souvenir cup and saucer set illustrates the role of Redcliffe as a seaside resort during the early 20th century. The legend on the two pieces reads "Overlooking Sutton's Beach Towards Scott's Point" and features an image of the beach. Both Sutton's Beach and Scott's Point were popular spots for beach goers. T.W. Comyn's "Souvenir of Humpybong", written in 1908, describes the north end of Scott's Point as having "a nice nook for bathing in any weather or state of the tide, it being protected from westerly winds and absolutely safe from the inroads of sharks. The sand is very firm in some places, and being of a brown tint, there is no glare." The advantages of the area are obvious! Redcliffe was popular in that it had many sheltered, mild surf beaches while its main competition, Southport, had less attractive surf beaches generally considered suitable only for the rugged and somewhat uncouth. The cup and saucer set is a recent donation to the Museum and adds to the small collection of souvenir china already in the collection. Onoda was Redcliffe's first 'Sister City'. For a number of years there had been an active student exchange program operating between Onoda and Redcliffe. An invitation was received from the municipal authorities of Onoda for Redcliffe to join them in a 'sister city' partnership. Onoda and Redcliffe have some common features - both are on the coast, have similar sized populations and fishing is an important industry. 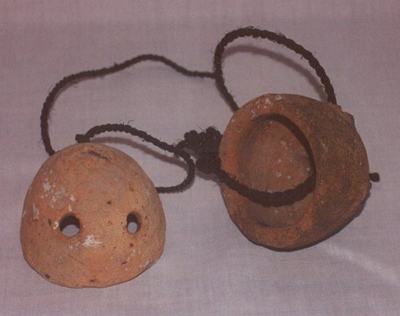 The clay octopus pots (Sueki No Takotsubo) are the oldest items in Redcliffe Museum's collection. They are estimated to be 1400 years and were found on the Motoyamo Coast near Onoda. The pots represent a large collection of objects held by Redcliffe Museum, gifted by the Onoda Historical Museum as part of the 'Sister City' relationship. In turn the Redcliffe Museum also gifted a number of items to the Onoda Historical Museum. The Director of the Onoda Historical Museum personally came to Redcliffe to assist with translations and ensure that the historical details for each object were correct and appropriate. As a result Redcliffe Museum boasts a large Onoda display and maintains an interesting and diverse Japanese collection. This small tortoise shell clasp-style serviette ring with ornamental 'J' done in fretwork style on the front of ring is a treasure with a strong connection to Redcliffe. The serviette ring belonged to John Oxley who in many ways was responsible for the foundation of Redcliffe as the first white settlement in Queensland. Oxley entered Moreton Bay on 29 November 1823 and was at least the third major explorer to sight the Bay. His task was to scout for potential settlements for the worst convicts who were considered too criminal for the main settlements in the south. As a former Navy lieutenant, Oxley found the Redcliffe site militarily attractive because every ship entering the Brisbane River would have to pass the point, at least until alternative routes to the south were found. Redcliffe was safe because it was simple to navigate from the sea and the area was not subject to the shifting sandbars and changing currents that affected much of the rest of the Bay. Despite this Oxley felt that the site was too landlocked for what might become a large city. He reported that Redcliffe might be viewed as a naval post or depot for stores rather than be adapted for principal settlement. Despite this the Amity arrived at Redcliffe under the command of Oxley, and on the 13th of September 1824, Redcliffe became Queensland's first white settlement, if only for a matter of months. An unknown convict made the serviette ring for John Oxley around the 1830s. It was donated to the Redcliffe Central Chamber of Commerce by his great great granddaughter, Miss Jean Oxley Waugh, on the occasion of the 1987 Redcliffe First Settlement Festival. 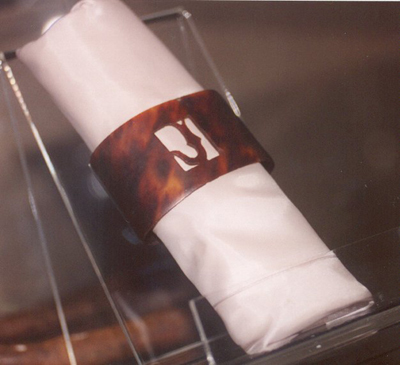 In turn the Chamber of Commerce donated the serviette ring and its accompanying showcase to the Redcliffe Historical Society, then managers of the Redcliffe Museum. In 1891 Sir Samuel Griffith, then Queensland Premier, sailed to Sydney on board the iron hulled paddle steamer Lucinda. The purpose of the journey was to attend a conference on Federation called by Sir Henry Parkes. At the conference, a committee was formed to draft a constitution for an Australian Federation. The committee, headed by Griffith, boarded the Lucinda and a draft constitution was written while it sailed the Hawkesbury River region. This dining table was located in the Captain's State Room on the Lucinda. As important meetings were held in the stateroom, the drafting of the constitution would have occurred there. 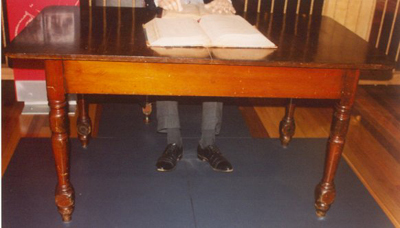 It is likely that the first draft of the Australian Constitution was written on this very table. The four-legged table is quite plain, stained a dark brown with turned legs. If you look at each leg of the table, about three inches from the floor you can see plugs covering holes. A brass rail ran between these holes and was fixed to the cabin floor to stop the table moving in rough weather. The Lucinda was sold in 1923 to a Brisbane foundry. Most of the furniture was later sold. Edward Phelan, the managing director of the foundry, retained some pieces. One of these was the table which he passed on to his family. His grand-daughter, Marie E Deere, donated the table to the Redcliffe Museum in 1998.